Welcome to 3DAllusions Rendering Studio! At 3DAllusions we are passionate about our craft, so passionate we’ve created a whole community of like minded artist to share ideas and techniques in order to constantly improve our skill set. This passion is reflected in everything we do! Check out 3DAllusions.com In addition to 3DA, we have created MrMaterials.com a materials and tutorial repository for visualization artist using the 'mental ray' rendering engine. We eat and breath computer graphics and are constantly honing our skills. We are artist; doing what we love to do and it shows in our work. 3DAllusions Studio specializes in 3D architectural renderings, 3D architectural visualization, and animations. 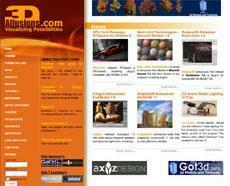 3DAS also focuses on 3D modeling, 3D illustrations, graphic design, industrial design, and product illustration. We are professional artists and architects serving architects, developers, and interior designers to create stunning, photorealistic and non-photorealistic architectural renderings that breath life into your designs and help you 'Visualize the Possibilities'. 3DAS offers various cost effective solutions for your marketing, advertising, and creative needs. Serving the local market of the Pacific Northwest; Seattle/Portland/Vancouver regions in addition to our International clientele.